Once, bookkeepers were valorized in great art. Sound funny now? The joke might be on us. courtesy National Gallery of Art, Washington, D.C. Portrait of a Merchant, c. 1530, by Jan Gossaert. In Washington’s National Gallery of Art hangs a portrait by Jan Gossaert. Painted around 1530, at the very moment when the Dutch were becoming the undisputed masters of European trade, it shows the merchant Jan Snouck Jacobsz at work at his desk. The painter’s remarkable gift for detail is evident in Jacobsz’s dignified expression, his fine ermine clothes and expensive rings. Rendered just as carefully are his quill pen, account ledger, and receipts. This is, in short, a portrait of not only wealth and material success, but of accounting. It might seem strange that an artist would lavish such care on the nuts and bolts of something so mundane, like a poet writing couplets about a corporate expense report. 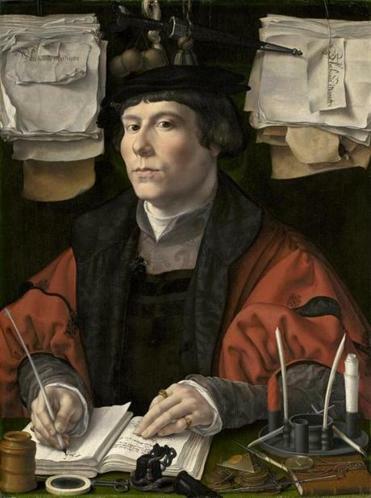 But the Jacobsz portrait is far from unique: Accounting paintings were a significant genre in Dutch art. For 200 years, the Dutch not only dominated world trade and portrayed themselves that way, but in hundreds of paintings, they also made sure to include the account books. This was not simply a wealthy nation crowing about its financial success. The Dutch were the leading merchants of their time, and they saw good accounting as the key to both their wealth and the moral health of their society. To the audience of the time, the paintings carried a clear message: Mastering finance was an achievement requiring both skill and humility. Today when we see accountants in art or entertainment, they are marginal figures—comically boring bean-counters or fraudsters cooking the books. Accounting is almost a synonym for drudgery: from the hapless daydreamer Walter Mitty to the iconic nerd accountant Rick Moranis plays in “Ghostbusters.” Accounting is seen as less a moral calling than a fussy brake on the action. In the wake of decades of financial scandal—much of it linked to creative accounting, or to no accounting all—the Dutch tradition of accounting art suggests it might be us, not the Dutch, who have misjudged accounting’s importance in the world. Accounting in the modern sense was still a new idea in the 1500s, one with a weight that carried beyond the business world. A proper accounting invoked the idea of debts paid, the obligation of nightly personal reckonings, and even calling to account the wealthy and powerful through audits. It was an idea powerful enough to occupy the attention of thinkers in religion, art, and philosophy. A look back at the tradition of accounting in art shows just how much is at stake in “good accounting,” and how much society can gain from seeing it, like the Dutch, not just as a tool but as a cultural principle and a moral position. Scratches on ancient tablets show us that accounts have been kept for as long as humans have been able to record them, from ancient Mesopotamians to the Mayans. This kind of accounting was about measuring stores: Merchants and treasurers recorded how much grain, bread, gold, or silver they had. Most ledgers were simple lists of assets or payments. Accounting in the modern sense started around 1300 in medieval Italy, when multipartner firms had to calculate their investments in foreign trade. We don’t know who, if anyone, can take credit for the invention, but it was around this time that double-entry bookkeeping emerged in Tuscany. Instead of a simple list, it consisted of two separate columns, recording income in one against expenditures in the other. Every transaction of expenditure could be checked against corresponding income: If one sold a goat for three florins, one gained three florins and, in the other column, lost a goat. It was a kind of self-checking mechanism that also helped calculate profit or loss. In Hogarth’s “Marriage a la Mode: The Tête a Tête,” the man with the account books walks off in disgust (left). It would come to change finance, but was not an immediate hit. Any system of enforcing fiscal discipline is an incursion against the absolute control of the account-holder, and kings and the powerful tended to see themselves above the merchant-like calculations of bookkeeping. They not only hid their wealth and debts: They often did not bother to calculate them. In the end, they saw themselves as only accountable to God; if they needed more ready cash, they could always lean on their inferiors. At least in the short run, it was far more comfortable to govern without the constraints of financial accountability. But in one place, the idea of financial accountability did take hold. By the early 1500s, Holland had become the center of global trade, with Antwerp and later Amsterdam acting as the most important ports in the world. Ships arrived laden with spices, exotic fruit, minerals, animals, whale oil, cloths, and other luxury goods. In 1602, the Dutch government in essence created modern capitalism by founding both the first publicly traded company—the Dutch East India Company, or VOC—and the Amsterdam Stock Exchange. Accounting was central to managing not only these companies, but also the Dutch government itself. While not all tax collectors or company managers kept perfect double-entry books, it represented an ideal. It was also seen as a necessary skill for civic participation. Most members of Dutch society were fluent in accounting, having studied at home or in publicly funded city accounting schools. Double-entry accounting made it possible to calculate profit and capital and for managers, investors, and authorities to verify books. But at the time, it also had a moral implication. Keeping one’s books balanced wasn’t simply a matter of law, but an imitation of God, who kept moral accounts of humanity and tallied them in the Books of Life and Death. It was a financial technique whose power lay beyond the accountants, and beyond even the wealthy people who employed them. Accounting was closely tied to the notion of human audits and spiritual reckonings. Dutch artists began to paint what could be called a warning genre of accounting paintings. In Jan Provost’s “Death and Merchant,” a businessman sits behind his sacks of gold doing his books, but he cannot balance them, for there is a missing entry. He reaches out for payment, not from the man who owes him the money, but from the grim reaper, death himself, the only one who can pay the final debts and balance the books. The message is clear: Humans cannot truly balance their books in the end, for they are accountable to the final auditor. This message rubbed off on political and financial leaders. They were expected to keep good books, and they could expect to be publicly audited—a notion fiercely resisted in the great monarchies of the Continent. In the 17th century, another genre of paintings emerged, showing public administrators holding their books open for all to see. More than 100 of these paintings were produced between 1600 and 1800. Transparency became a cultural ideal worthy of art. The Dutch also appreciated that ledgers, bills of exchange, and files, like any tool in human hands, were liable to misuse in the interest of wealth or pride. Dutch painters like Marinus van Raemerswaele warned against hubris and greed with paintings of bookkeepers as twisted, grotesque figures in absurd hats who would be as likely to commit fraud as to keep good books. The value the Dutch placed on accounting made a large impression on the English, who sought to emulate “the Mighty Dutch” in many ways, including this new business technique. By the 1700s, they were also the only other nation to paint accounting pictures. The English celebrated the wealth of their Industrial Revolution and Empire with portraits of successful merchants smiling over their books—and, like the Dutch, also used account books as a way to wag a finger. 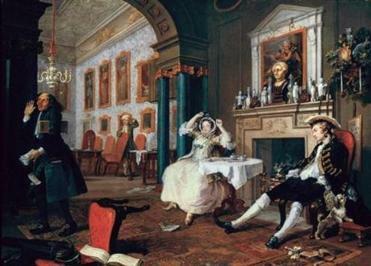 In one scene from William Hogarth’s “Marriage à la Mode,” a popular series of paintings from the 18th century, a noble couple squanders their lives on parties and gambling. In a final signal of disapproval, almost like a punctuation mark, their accountant walks away in disgust. By the late 19th century, accounting had become a profession of its own, rather than fundamentally a shared practice and value. It receded from the lives of individuals, and began to take on more the reputation it holds today. As it became more remote, and as financial scandals piled up—even in Britain and Holland—accounting gained a dual reputation for being both boring and possibly fraudulent. Writers such Charles Dickens, Honoré de Balzac, and Louisa May Alcott, to name but a few, included accounting in their work, showing it as a double-edged sword which was used by humble honest clerks and grandiose swindlers alike. Today, the internal ethics of accounting have receded from public view. No one publicly celebrates the virtues of balancing one’s books and of audits with great art or gripping characters. Occasionally an accounting hero emerges, bringing a billion-dollar loss to light, but few people appreciate it, as the Dutch did, as a profound moral advance in business and public affairs. Yet, in ignoring this aspect of accounting, or leaving it to the technical whizzes inside the financial world, we’re losing something important. In a world driven by money, in which everyone tends to be answerable to money, accounting offers a toolkit for anyone to at least understand the basic principles that are supposed to guide finance—as well as a genuinely independent kind of moral reckoning for its practitioners. The balancing of books still provides a dramatic language of financial morality, with numbers telling stories of riches and ruins, or hiding them. But before we can speak and decipher it, we too need to learn to balance our books. Jacob Soll is a professor of history at the University of Southern California. His new book, “The Reckoning: Accountability and the Rise and Fall of Nations” (Basic Books), was released in April. Correction: An earlier version of this article misidentified the location of the painting by Jan Gossaert of Jan Snouck Jacobsz.